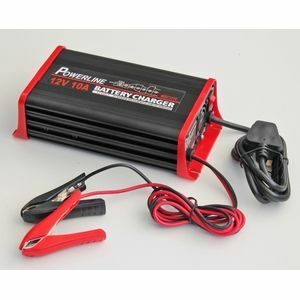 Nice compact 7 stage intelligent charger at a very competitive price, would recommend. Hard to rate the performance without a lot of measuring kit but it does seem to work well enough for a mid-priced unit. I ordered it on the basis that a specialist battery supplier should be able to source a good quality and good value unit. Time will tell if that was a wise assumption. One grumble: the legend for the "7 stage" indicator LEDs could be masked out by half a postage stamp so you may need to have your reading glasses at the ready. Excellent, compact charger and good service from Tayna. Just the job! Super little charger. it certainly packs some power into my marine deep cycle battery! Good does exactly as described. Very pleased with charger, fully charges my 85ah leisure battery in less than 8 hours, and nice to have the reassurance that if the battery is left on charge it is just trickle charging and quite safe. Arrived promptly and exactly in the hour specified. This charger is small, so doesn't take up much room. It has been in continuous use now since receipt, and it works through the stages very well. I have three 85A/H batteries, two of which haven't been used for a number of years, so I did an extreme test and tried the charger on them, to see if it could recover them. Although not 100% results in charges so far, the older batteries were recycled from badly discharged, and one provided power for over an hour (which is more than I expected) on a 5 Amp load test, which was quite impressive. I suspect that if I keep on with the cycling, they may even improve a bit more. Time will tell. The charger is intended for a new battery in the Spring, but it is a good test for it at the moment, and I'm very pleased with the results. Thank you for a great piece of kit. It is a battery charger that charges batteries. It works exactly as described. Tayna logistics very good as usual. A good company to deal with. As a note I had a defective battery from Tanya a year ago and they dealt with it very well so I have been a loyal customer ever since!.